- You'll love the vibrant colors and beautiful details in this chart based on artwork by Leia Frazier. 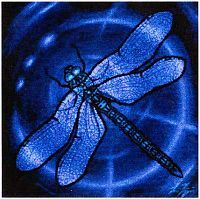 In the language of animals, a dragonfly totem is a symbol of transformation. These wondrous creatures are born in water, and live there for several years before they undergo a tremendous metamorphosis, and take to the sky. 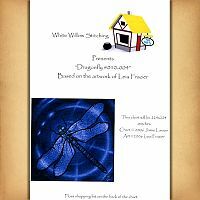 Darting through the air on gossamer wings, dragonflies teach us to look at all things with different perspectives. Design measures 224 stitches square. Do you have any other questions about our Dragonfly Cross Stitch Pattern?